The founders of Geemit has a long history in the industry, however with new eyes on their busienss models a new strategy plan emerged and now they have expanded to large international markets, with great help from participating in the 2018 Next Step Challenge program. Geemit is based on the idea of sharing resources. The sharing economy has entered the offshore oil & gas business with intelligent and structured handling of stock facilities along with an online trading platform for surplus spare parts. Visualizing hidden resources and ensuring these assets are accessible to the market. That is the two faces in our business model. 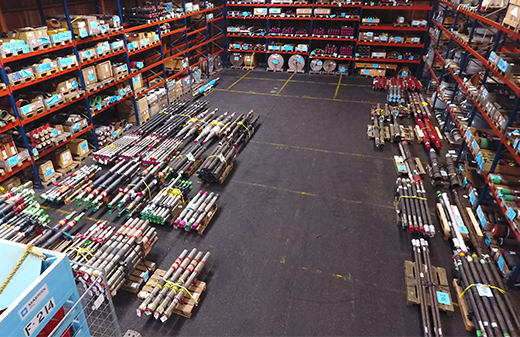 One is identifying and handling the unused stock items in the offshore business and the second leg is assisting in achieving the right documentation and certification to resell the parts again. It is all about creating value for the items again,” explains Søren Hvorslev from Geemit in Esbjerg. And with expert knowledge within both well-service, drilling and production, the team behind Geemit has a solid knowledge in the offshore industry. “However, by joining the Next Step Challenge program we now get valuable advices from senior business partners in very different industries and not just within offshore. Other perspectives are very healthy for our business,” says Søren Hvorslev. Geemit is more than just an ordinary trading portal as adding expert knowledge makes the business case unique and is closing a huge gap in the industry. So, by joining this business development program, Geemit aims to exploiting the full potential in the market. We needed someone from the outside to see our business models and to challenge how we do things. And already after 9 months we are expanding to large international markets with our new verified strategies that we made during the program. I will enhance other companies to join the Next Step Challenge program, as getting out there and getting advice is the most valuable way to develop your business. It is like getting a lot of small boxes with advice and then you can open them one by one when you are ready,” ends Søren Hvorslev. Is your spare parts collecting dust?